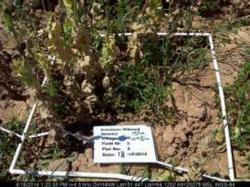 Equipo Nizkor - Afghanistan: Opium Survey 2014 - Cultivation and Production. The total area under opium poppy cultivation in Afghanistan was estimated at 224,000 hectares in 2014, a 7% increase from the previous year. The vast majority (89%) of opium cultivation took place in nine provinces in Afghanistan's Southern and Western regions, which include the country's most insecure provinces. Hilmand remained Afghanistan's major opium-cultivating province, followed by Kandahar, Farah, and Nangarhar. 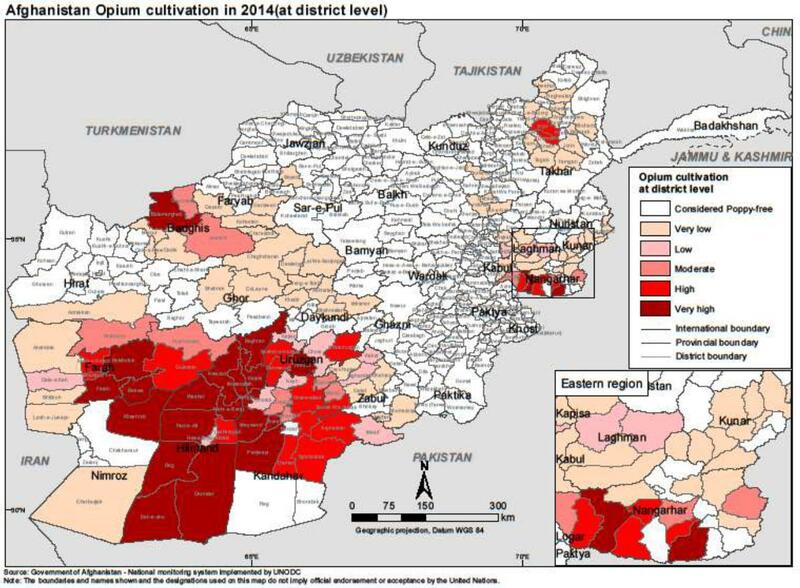 Opium cultivation increased in most of the main poppy-cultivating provinces, but stabilized in Hilmand itself (+3%). Interestingly, differing trends could be observed in Hilmand. Inside the former "Food Zone" (an alternative livelihood programme), opium cultivation increased by 13% in 2014 (to 41,089 hectares from 36,244 hectares in 2013). However, outside the former Food Zone, where the increases in poppy cultivation seen in previous years were mainly achieved through artificial irrigation, the area under poppy cultivation decreased slightly. Total eradication of opium poppy decreased by 63% in 2014, to 2,692 hectares. Average opium yield amounted to 28.7 kilograms per hectare in 2014, which was 9% more than in 2013 (26.3 kilograms per hectare). Opium yields in the Southern region, which drive overall production, increased by 27%, from 23.2 kilograms per hectare in 2013 to 29.5 kilograms per hectare in 2014. However, yields in the Southern region were still at relatively low levels in comparison to their levels prior to 2010. Potential opium production was estimated at 6,400 tons in 2014, an increase of 17% from its 2013 level (5,500 tons). This increase can be mainly attributed to a strong increase in production in the Southern region, where yields increased by 27% (from 23.2 kilograms per hectare in 2013 to 29.5 kilograms per hectare in 2014). Accounting for 69% of national production, the Southern region continued to produce the vast majority of opium in Afghanistan. With 16% of national production, the Western region was the country's second most important opium-producing region in 2014. At US$ 0.85 billion, or the equivalent of roughly 4% of Afghanistan's estimated GDP, the farm-gate value of opium production decreased by 13% in 2014. 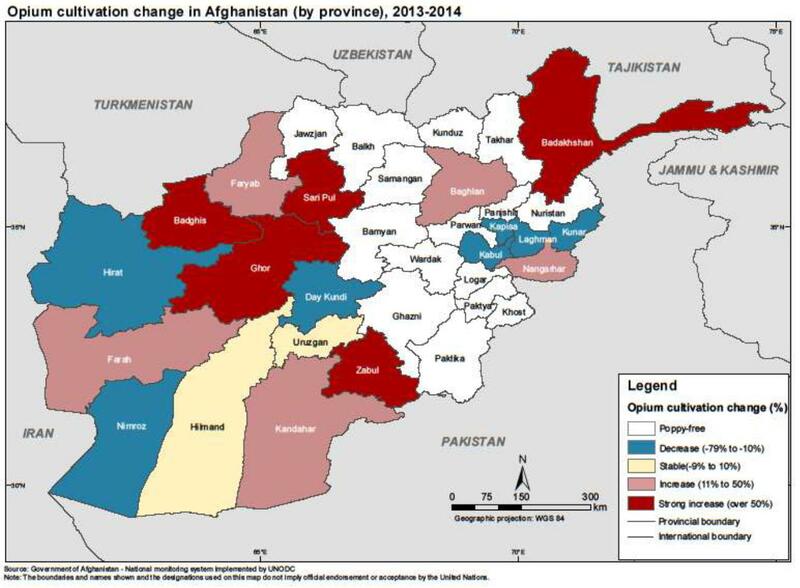 In 2014, opium prices decreased in all regions of Afghanistan. One probable reason for the decrease was an increase in supply due to an increase in production. Based on recent data on the morphine content of Afghan opium, the heroin conversion ratio, which describes the amount of opium needed to produce a kilogram of heroin, has been updated. For converting opium to pure heroin base, a ratio of 18.5:1 is estimated; for heroin of export quality (impure heroin of 52% purity), a ratio of 9.6:1 is estimated. These ratios replace the former ratio of 7:1 for converting opium to heroin of unknown purity. The Afghanistan Opium Survey is implemented annually by the Ministry of Counter Narcotics (MCN) of Afghanistan in collaboration with the United Nations Office on Drugs and Crime (UNODC). The survey team collects and analyses information on the location and extent of opium cultivation, potential opium production and the socio-economic situation in rural areas. Since 2005, MCN and UNODC have also been involved in the verification of opium eradication conducted by provincial governors and poppy-eradication forces. The results provide a detailed picture of the outcome of the current year's opium season and, together with data from previous years, enable the identification of medium- and long-term trends in the evolution of the illicit drug problem. This information is essential for planning, implementing and monitoring the impact of measures required for tackling a problem that has serious implications for Afghanistan and the international community. The opium survey is implemented within the technical framework of the UNODC Illicit Crop Monitoring Programme (ICMP). The objective of ICMP is to assist the international community in monitoring the extent and evolution of illicit crops in the context of the Plan of Action adopted by the United Nations (the 53rd session of the Commission on Narcotic Drugs in March 2009). Under ICMP, monitoring activities currently supported by UNODC also exist in other countries affected by illicit crop cultivation: in Asia, Myanmar and the Lao People's Democratic Republic; in Latin America, the Plurinational State of Bolivia, Colombia, Ecuador, Mexico and Peru; in Africa, Nigeria. The Afghanistan Opium Survey 2014 was implemented under project AFG/F98, "Monitoring of Opium Production in Afghanistan", with financial contributions from the Governments of Germany, Norway, the United Kingdom of Great Britain and Northern Ireland, and the United States of America. The total area under opium poppy cultivation in Afghanistan was estimated to be 224,000 hectares (200,000-250,500) in 2014, which represents a 7% increase from 2013. 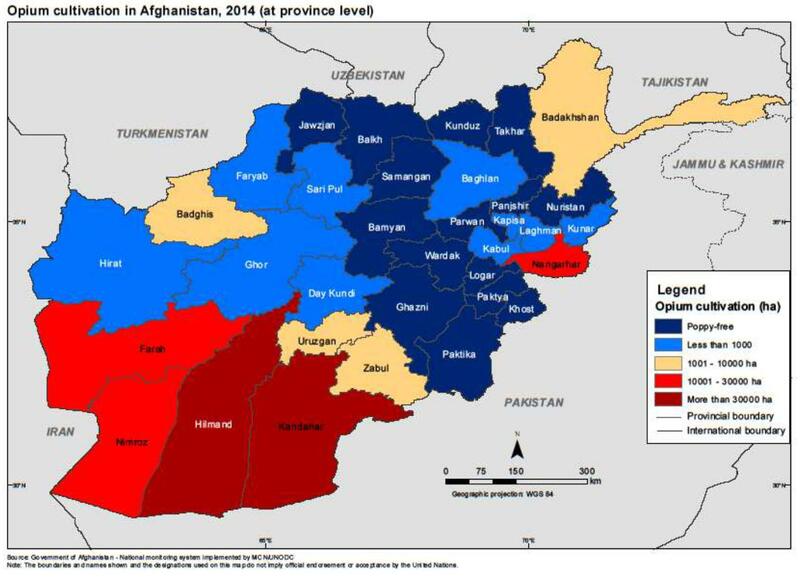 In 2014, 98% of total opium cultivation in Afghanistan took place in the Southern, Eastern and Western regions of the country: in the Southern region, 67% was concentrated in Day Kundi, Hilmand, Kandahar, Uruzgan and Zabul provinces; in the Western region, 22% was concentrated in Badghis, Farah, Hirat and Nimroz provinces; in the Eastern region, 9% was concentrated in Nangarhar, Kunar, Laghman and Kapisa provinces. These are the most insecure provinces, with a security risk classified as "high" or "extreme" by the United Nations Department of Safety and Security (UNDSS), and they are mostly inaccessible to the United Nations and NGOs. Day Kundi is the only province in the South where security is generally good, with the exception of Kejran district. Hilmand remained the country's major opium-cultivating province (103,240 hectares), followed by Kandahar (33,713 hectares), Farah (27,513 hectares), Nangarhar (18,227 hectares), Nimroz (14,584 hectares), Uruzgan |5| (9,277 hectares), Badghis (5,721 hectares), Badakhshan (4,204 hectares), Zabul (2,894 hectares), Laghman (901 hectares), Kunar (754 hectares), Hirat (738 hectares) Day Kundi |6| (587 hectares), Ghor (493 hectares), Kapisa (472 hectares), Kabul (233 hectares) and Sari Pul (195 hectares). 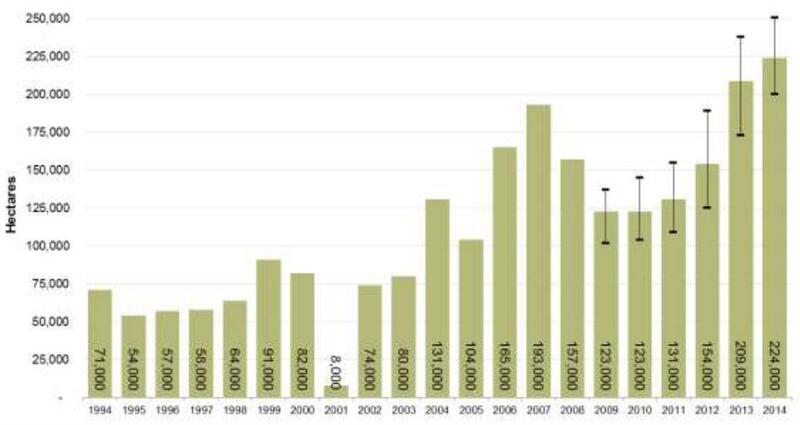 Sources: UNODC and UNODC/MCN opium surveys 1994-2014. The high-low lines represent the upper and lower bounds of the 95% confidence interval. With the exception of the Central region, all regions experienced an increase in poppy-cultivation levels in 2014, with the largest relative increase being in the North-eastern region (79%; mainly driven by increases in Badakhshan), followed by the Eastern (9%), Western (8%) and Northeastern regions (4%). However, the vast majority (89%) of total opium cultivation took place in nine provinces in Afghanistan's Southern and Western regions. Opium cultivation increased in most of the main opium poppy-growing provinces, including Badakhshan, Badghis, Nangarhar, Kandahar, Farah, Hilmand, whereas it decreased in Nimroz and Uruzgan provinces. The number of poppy-free provinces in Afghanistan remained stable in 2014. In the Northern region, Balkh regained its poppy-free status, whereas Sari Pul lost its poppy-free status. In the Eastern region, cultivation decreased in Kunar, Laghman and Kapisa provinces by 33%, 27% and 19%, respectively, but increased in Nangarahar province by 16%. 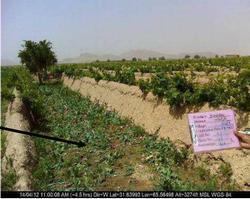 Cultivation in Nangahar again reached the level it had before becoming poppy-free in 2007. Only 34 hectares of opium poppy cultivation were eradicated in Nangarhar province in 2014. In the North-Eastern region, Badakhshan saw a 77% increase in opium poppy cultivation, from 2,374 hectares in 2013 to 4,204 hectares in 2014. This happened despite the eradication of 1,411 hectares of opium poppy in 2014. In the Northern region, Balkh province regained its poppy-free status. However, Sari Pul province lost its poppy-free status, though its level of cultivation remained very low. Opium cultivation in Baghlan province increased by 19%, to 168 hectares in 2014 from 141 hectares in 2013. In the Southern region, with increases of 117%, 34%, 19% and 3% in Zabul, Kandahar and Hilmand provinces, respectively, opium cultivation increased in most provinces. Hilmand remained the country's principal opium-cultivating province in 2014, accounting for 46% of total opium cultivation. Poppy cultivation in Uruzgan and Day Kundi provinces in 2013 and 2014 cannot be compared with previous years because cultivation in Gizab district, which was previously part of Day Kundi province, was considered in the 2014 area estimation of Uruzgan. In the Western region, the main poppy-cultivating provinces in 2014 were Farah and Nimroz. The area under opium cultivation in Farah province increased from 24,492 hectares in 2013 to 27,513 hectares in 2014 (an increase of 12%). With 14,584 hectares under cultivation, Nimroz province remained the second largest opium-cultivating province in the Western region in 2014, even though opium cultivation in Nimroz decreased by 10% from its 2013 level. In 2014, no eradication took place in the Western region, except in Ghor province where a total of 8 hectares was eradicated. * In 2014, Gizab district of Day Kundi province was considered under Uruzgan province, as per presidential decree. The 2014 poppy-cultivation estimates of Day Kundi and Uruzgan are therefore not comparable with previous years. Area estimation method: S=remote sensing sample survey, T=remote sensing target survey, V=village sample survey and field observation. See Methodology section for detailed description of methods used. A province is defined as poppy-free when it is estimated to have less than 100 hectares of opium cultivation. * In 2014, Gizab district of Day Kundi province was considered under Uruzgan province as per presedential decree. The 2014 poppy cultivation estimates of Day Kundi and Uruzgan are therefore not comparable with previous years. Opium cultivation in the Central region decreased by 22% in 2014, with the total area cultivated decreasing to 233 hectares from 298 hectares in 2013. Opium cultivation was limited to the Uzbeen valley of Surobi district in Kabul province, where security is extremely poor. 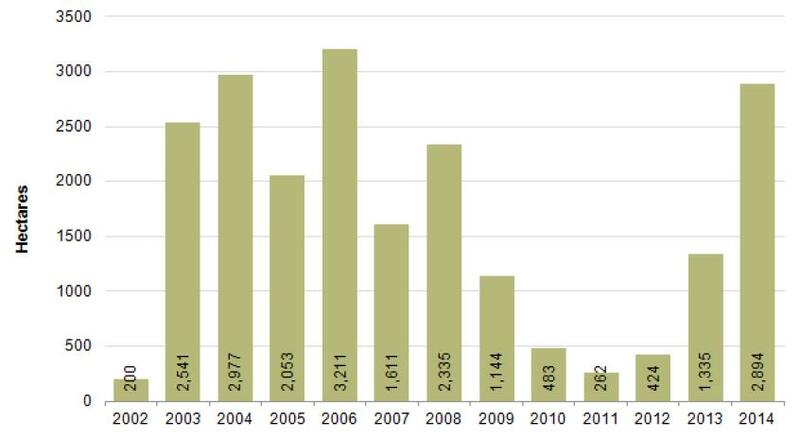 There was no eradication in Kabul province in 2013 and 2014. With the exception of Kabul, all provinces in the Central region have been poppy-free since 2008 and remained so in 2014. The Eastern region experienced a 9% increase in opium cultivation in 2014. A total of 20,353 hectares of opium was cultivated in the Eastern region, whereas only 136 hectares were eradicated. Traditionally an important poppy-growing province, Nangarhar experienced an increase in opium cultivation of 16% in 2014, to 18,227 hectares from 15,719 hectares in 2013, which was almost back to its 2007 level (18,739 hectares). Opium cultivation increased significantly in Sherzad, Achin, Pachir Wagam Chaparhar, Kot and Lalpoor districts, where security was very poor. Due to strong resistance by Anti-Government elements (AGE), only 34 hectares of opium cultivation were eradicated by Governor-led eradication in the province in 2014. 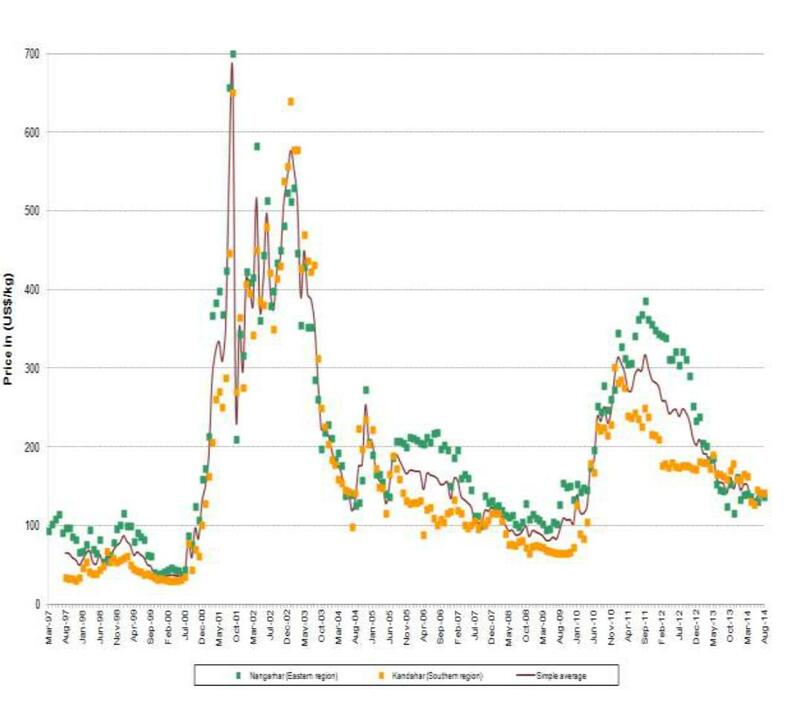 Note: a sampling approach was introduced in Nangarhar province in 2013, which increased the area under observation significantly in comparison to previous years when a target approach was employed. In Laghman province, opium cultivation decreased by 27%, from 1,236 hectares in 2013 to 901 hectares in 2014. At the district level, significant decreases occurred in Dowlat Shah (-97%), Alisheng (-41%) and Alingar (-5%). However, cultivation increased to 137 hectares (15%) in Mehterlam district. In Kunar province, opium cultivation decreased by 33% in 2014, with the main opium-cultivation districts being Asada bad, Dara-i-Pech and Shigal Wa Sheltan. Opium cultivation in Kapisa province decreased by 19% in 2014, from 583 hectares to 472 hectares, with Tagab its main opium-cultivating district. Nuristan maintained the poppy-free status it achieved in 2007. Opium cultivation in the North-eastern region reached 4,204 hectares in 2014, an increase of 77% from 2013. However, the increase only occurred in Badakhshan province as the two other provinces in the region, Kunduz and Takhar, have been poppy-free since 2007 and 2008, respectively. Opium cultivation in Badakhshan increased by 77% in 2014, to 4,204 hectares from 2,374 hectares in 2013, and was mostly confined to rain-fed areas cultivated in spring, mainly in Argo and Darayim districts where opium cultivation increased by 262% (2,046 hectares) and 87% (1,282 hectares), respectively. A total of 1,411 hectares of opium cultivation was eradicated and verified by MCN/UNODC in Badakhshan province in 2014. Kunduz province has been poppy-free since 2007 and is well known for growing a wide range of licit crops, from fruit and vegetables to cotton. An insignificant amount of cultivation has been observed in this province in recent years, and it remained under 100 hectares in 2014, the threshold for obtaining poppy-free status. Also poppy-free since 2008, Takhar province maintained its poppy-free status in 2014. Only one hectare was eradicated there in 2014. Opium cultivation increased by 19% in Baghlan province in 2014, though the level of opium cultivation was still low. The main opium-cultivating districts were Pul-i-Hisar and Deh Salah, where opium cultivation increased by 11% and 65%, respectively. Poppy-free from 2007 to 2012, Balkh province lost its poppy-free status in 2013 due to the 410 hectares cultivated in Chimtal district. However, the province regained its poppy-free status in 2014. 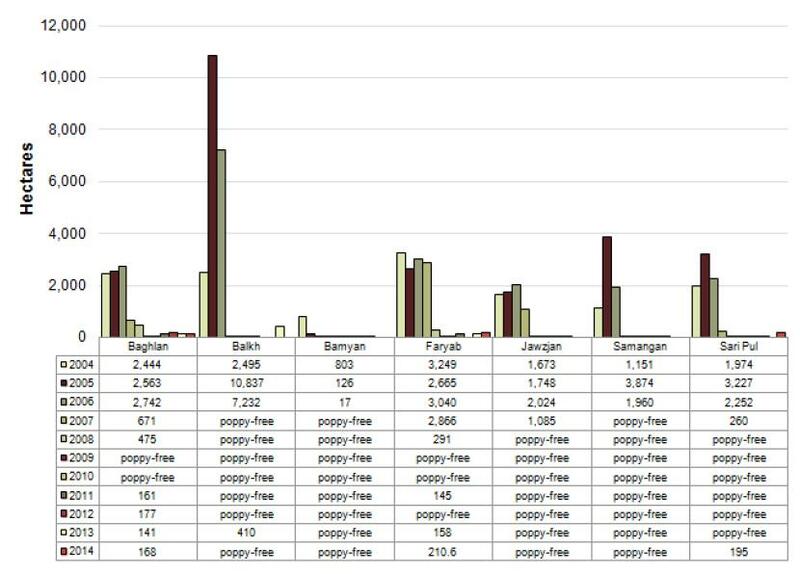 Faryab province was poppy-free in 2009, 2010 and 2012, but lost its poppy-free status in 2013. In 2014, opium cultivation increased by a further 33%, to 211 hectares from 151 hectares in 2013. Opium cultivation mainly took place in Kohistan, Qaysar and Gurziwan. Samangan and Bamyan have been poppy-free since 2007 and remained so in 2014. Due to its 195 hectares of opium cultivation in 2014, which mainly took place in Sayed district, Sari Pul lost the poppy-free status it obtained in 2008. Jawzjan province has been poppy-free since 2008 and maintained its poppy-free status in 2014. Accounting for 67% of total opium cultivation in Afghanistan, 149,711 hectares of opium poppy were cultivated in the Southern region in 2014, an increase of 6% from 2013. Gizab district, formerly part of Day Kundi province, was considered under Uruzgan province in 2014. The 2014 poppy cultivation estimates for Day Kundi and Uruzgan are therefore not comparable with previous years. However, opium cultivation in Day Kundi was 587 hectares in 2014, and the province's main opium-cultivating districts were Kajran, Sang-i-Takht and Shahristan. * In 2014, Gizab district of Day Kundi province was considered under Uruzgan province. The 2014 poppy cultivation estimates of Day Kundi and Uruzgan are therefore not comparable with previous years. With 103,240 hectares (46% of total opium cultivation in Afghanistan), an increase of 3% from 2013 (100,693 hectares), Hilmand remained Afghanistan's single largest opium-cultivating province in 2014, though it had the smallest rate of increase of all the provinces in the Southern region. The "Food Zone" alternative livelihood programme in Hilmand province came to an end in 2012, but significant differences could still be observed between the areas inside and outside the zone in 2014. Opium cultivation inside the former Food Zone increased by 13% in 2014 (from 36,244 hectares in 2013 to 41,089 hectares), representing roughly a fifth of the Food Zone's total agricultural area, but the extent of poppy cultivation was far greater outside the former Food Zone. More than a third of available land outside the Food Zone was under poppy cultivation in 2014, showing that, despite the increase following the end of the programme, opium cultivation was still relatively smaller inside the Food Zone than outside it. However, outside the Food Zone, where increases in poppy cultivation were mainly achieved by increasing the amount of agricultural land, the area under poppy cultivation slightly decreased. The Food Zone estimates refer to an area in ten districts of Hilmand (the "Food Zone" as of 2011, where farmers were provided with fertilizers, certified wheat seeds and high-value horticulture seeds in the poppy planting seasons for the 2009-2012 harvests. See Afghanistan Opium Survey 2009 and Methodology section. At the district level, opium cultivation levels in 2014 were highest in Nad Ali, Naher-i-Saraj, Kajaki, Nawzad, Garmser, Musa Qala, Regi-i-Khan Nishin, Sangin Qala, Baghran, Washer and Dishu districts. Significant increases from 2013 (230%, 85%, 44% and 40%, respectively) occurred in opium cultivation in Nawa-i-Barukzai, Garmser, Sangin Qala and Lashkargah districts (see district overview in the Annex). A total of 787 hectares of Governor-led opium poppy eradication was verified by MCN/UNODC in 2014, which corresponds to only 0.3% of estimated opium cultivation. In Kandahar province, opium cultivation reached 33,713 hectares in 2014, an increase of 19% from its 2013 level (28,335 hectares). The main opium cultivation districts were Maiwand, Zhire and Panjway. Opium cultivation in Uruzgan province was 9,277 hectares in 2014, with the province accounting for 4% of total Afghan opium cultivation. The 2013 and 2014 estimates cannot be compared, as Gizab district was considered under Uruzgan province in 2014 and not under Day Kundi province as in previous years. Dihrawud, Shahidi Hassas and Tirin Kot (provincial centre) were the main opium poppy-cultivating districts in Uruzgan province. However, opium cultivation decreased in Dehrawud, Shahidi Hasas and Chorah districts by 33%, 41% and 18%, respectively. Opium cultivation in Zabul province saw a significant increase of 117% in 2014, to reach 2,894 hectares, whereas it stood at 1,335 hectares in 2013 and 424 hectares in 2012. The main opium-cultivating districts in Zabul were Kakar and Mizan, where security was poor and opium cultivation was 1,168 hectares and 544 hectares, respectively. In the Western region, opium cultivation increased by 8% in 2014, to reach 49,049 hectares, whereas it was 45,557 hectares in 2013. This increase took place in three provinces, namely Badghis, Ghor and Farah, with Ghor and Badghis seeing the strongest increases (87% and 59%, respectively). Eradication was not carried out in the Western region, except in Ghor province where only 8 hectares of opium poppy were eradicated in 2014. The Western region consistently shows very high levels of opium cultivation. Insecurity continues to be a major problem as it compromises the rule of law and limits counter-narcotics interventions. Note: Since 2013, the Dilaram area, previously a district of Farah province, was reintegrated into Nimroz province. This reversed a boundary change that happened in 2009 when the Dilaram area, which had previously been part of Nimroz, was moved into Farah province. Opium poppy cultivation in Badghis jumped to 5,721 hectares in 2014 from 3,596 hectares in 2013, an increase of 59%. Its main opium-growing districts were Ghormach, Balamurghab and Jawand. In 2014, opium cultivation in Farah province was 27,513 hectares. However, due to administrative boundary changes, the 2013 and 2014 estimates are not comparable to those of 2012. The main opium-cultivating districts in Farah, where security is very poor, were Bakwah, Bala Buluk, Gulistan, Khak-i-Safed Farah (provincial centre), Pusht-Rod and Shib Koh in 2014. Increases in opium cultivation occurred in Bakwah (43%), Purchaman (304%) and Bala Buluk (40%). Decreases of 85%, 67%, 47% and 61% were also observed in Lash-i-Juwayn, Anar Darah, Gulistan and Qala-i-Kah districts, respectively. Poppy cultivation in Ghor increased by 87% in 2014, from 264 hectares to 493 hectares (Ghor was poppy-free in 2011). Only 8 hectares of eradication took place in Ghor province in 2014, which was not enough for the province to regain poppy-free status. In Hirat province, the level of opium poppy cultivation decreased by 22%, to 738 hectares in 2014 from 952 hectares in 2013. The only district in Hirat province where opium cultivation took place was Shindand, where security is very poor. In 2014, the level of opium poppy cultivation in Nimroz province decreased by 10% to 14,584 hectares. The main poppy cultivating district was Khash-Rod. A total of 2,692 hectares of verified poppy eradication was carried out by the provincial Governors in 2014, representing a decrease of 63% from 2013 when 7,348 hectares of Governor-led eradication (GLE) was verified by MCN/UNODC. In 2014, MCN/UNODC field surveyors verified the eradication of 10,221 fields in 480 villages in 17 provinces, whereas in 2013 MCN/UNODC verifiers visited 814 villages (20,374 poppy fields) in 18 provinces where eradication had been carried out by Governor-led eradication teams. 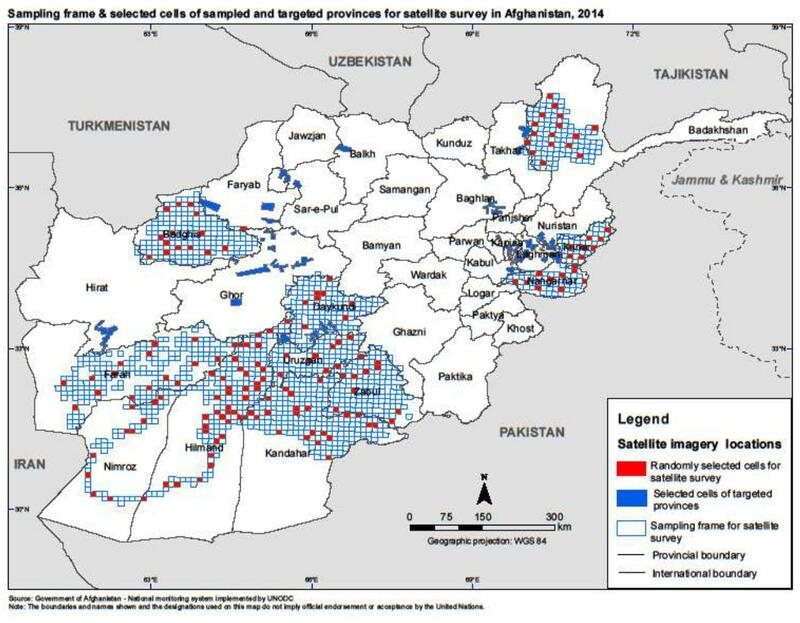 Quality control of eradication verification was carried out using satellite data in Badakhshan, Balkh, Hilmand, Kandahar, Kapisa, Nangarhar, Sari Pul and Uruzgan provinces. Final figures for eradication in these provinces are confirmed after checking with high-resolution satellite imageries supported by GPS tracking file, ground and Heli-pictures. For the provinces of Day Kundi, Kunar, Baghlan, Faryab, Ghor, Kunduz, Takhar, Laghman and Zabul provinces, the quality checks for eradication verification were made by scrutinizing the survey forms, checking the area measurement calculations and with the help of field photographs. 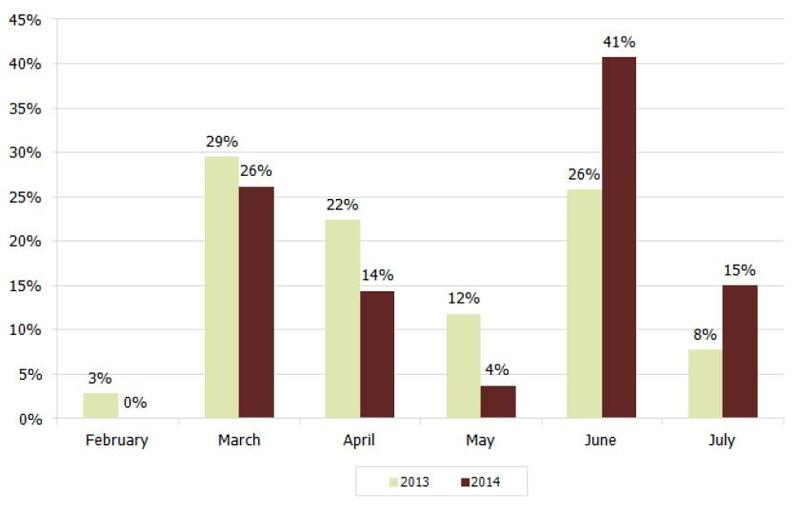 Governor-led poppy eradication campaigns were less active in all regions of Afghanistan in 2014 than in 2013. A total of 2,692 hectares of Governor-led poppy eradication was carried out in 2014, which corresponds to a decrease of 63% from 2013, when 7,348 hectares were eradicated in the the same 17 provinces. These provinces were: Badakhshan, Baghlan, Balkh, Day Kundi, Faryab, Ghor, Hilmand, Kandahar, Kapisa, Kunduz, Kunar, Laghman, Nangarhar, Sari Pul, Takhar, Uruzgan and Zabul. The Governor-led poppy eradication campaign commenced on 3 March 2014 in Hilmand province and on 16 April 2014 in Kandahar province, while the 2013 eradication activities began on 23 February 2013 in Hilmand and on 5 March 2013 in Kandahar province. The largest amount of poppy eradication was verified in Badakhshan province (1,411 hectares), a decrease of 50% from the eradication carried out in 2013 in the same province (2,798 hectares). Furthermore, the quality of eradication was very poor in Badakhshan province. In 2014, no eradication took place in Badghis, Farah, Hirat, Kabul and Nimroz provinces. The security situation continued to be unfavorable for Governor-led eradication campaigns in 2014 in all provinces where eradication was carried out. Resistance against poppy eradication operations was manifested in different ways, such as direct attacks on eradication teams and mine explosions. In 2014, 13 lives were lost (8 police, 3 members of the Afghan National Army and 2 farmers) and 26 persons were injured (13 Police, 2 Afghan Local Police, 8 members of the Afghan National Army, one farmer, one tractor driver and one verifier). 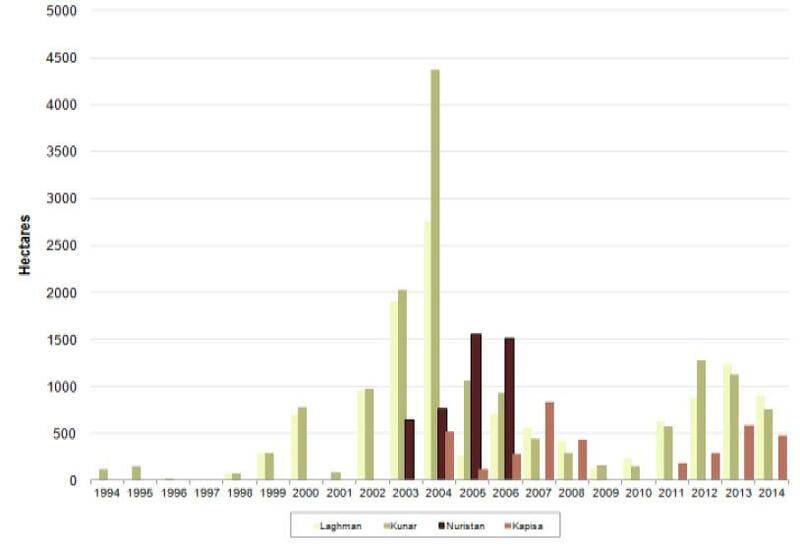 Among other eradication methods, GLE teams mainly used tractors and manual eradication (sticks, blades, hands and uprooting) in 2014, with 49% of GLE being carried out by tractor/ATV and 51% by manual methods. * Provinces checked with satellite imagery. * The "Poppy Eradication Force " (PEF), a centrally-directed eradication force, ceased operations in 2009. ** Net opium cultivation after eradication. 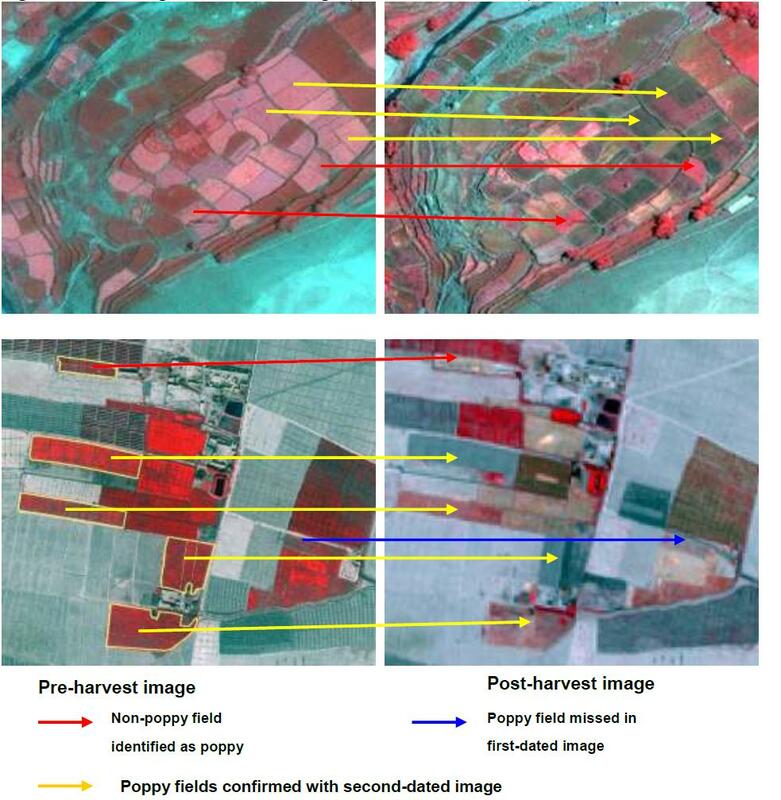 As in previous years, in 2014, MCN/UNODC procured high-resolution satellite images based on the field coordinates recorded by verifiers in eradicated poppy fields to validate the authenticity of reports and generate more accurate area figures by on-screen digitization of the eradicated fields. The Governor-led eradication of opium poppy in Badakhshan, Balkh, Hilmand, Kandahar, Kapisa, Nangarhar, Sari Pul and Uruzgan provinces was checked with satellite images. Satellite images were supported with heli-pictures collected during over-flights. Since 2013, surveyors have generated a GPS track around eradicated fields that provides both the location and shape of the fields. 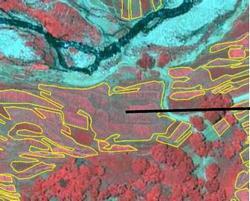 These tracks have helped verification of eradicated fields with satellite imagery. In 2014, satellite images of eradicated fields were interpreted and compared with the figures available on the ground and, in general, a good match was observed between them. Badakhshan province was an exception, as 554 hectares of eradication was over-reported and the province's final eradication figure was corrected to 1,411 hectares. The quality of eradication was very poor in Badakhshan province: less than 80% of the area of most fields was eradicated. In Kandahar province, over-reporting to the extent of 26 hectares was observed, which led to a corrected eradication figure of 68 hectares. Eradication reported by verifiers in Hilmand province was checked with satellite imagery and over-reporting to the extent of 114 hectares was confirmed. The final eradication figure in Hilmand province was thus corrected to 787 hectares. The quality of eradication seen on both satellite images and heli-pictures was generally very good and effective in most places in Hilmand province. 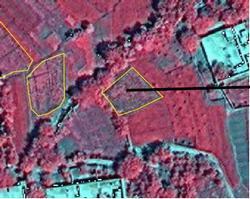 In Nangarhar province, eradication reported by verifiers was checked with satellite images and over-reporting to the extent of 8.8 hectares was confirmed. 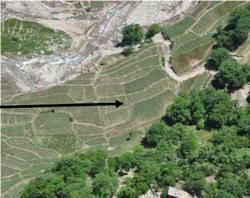 The final eradication figure in Nangarhar province was corrected to 34 hectares. Eradication reported by verifiers in Uruzgan province was checked with satellite images and over-reporting to the extent of 58 hectares was confirmed. The final eradication figure in Uruzgan province was corrected to 163 hectares. Eradication was mainly carried out with sticks and, based on field measurement with satellite imagery and the quality of eradication reported by verifiers, the final eradication area was calculated. Most of the fields were only partially eradicated. In Kapisa province, eradication reported by verifiers was checked with satellite images and 2 hectares of under-reporting was confirmed. The final eradication figure in Kapisa province was corrected to 26 hectares. 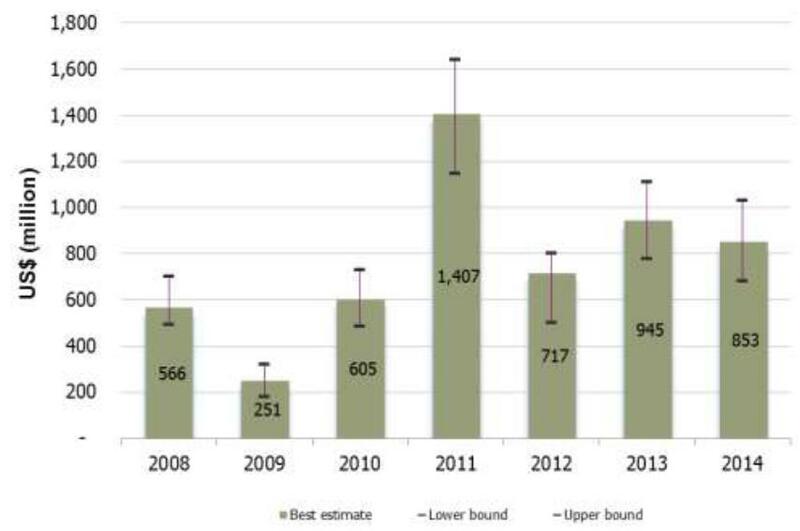 In 2014, estimated potential opium production in Afghanistan amounted to 6,400 tons (5,1007,800 tons), an increase of 17% from its 2013 level (5,500 tons). Average opium yield amounted to 28.7 kilograms per hectare in 2014, which was 9% more than in 2013 (26.3 kilograms per hectare). The increase in production was mainly the result of an increase in opium cultivation and yield. The 27% increase in yield in the Southern region, in particular, caused an increase in overall production. However, as in the previous year, adverse weather conditions in parts of the Western and Southern regions affected poppy plants, thereby reducing the yield in comparison to the relatively unaffected 2011 yield (44.5 kilograms per hectare). In the Southern region, for example, the yield survey showed a reduction of more than 39% from its 2011 level. In 2014, a total of 135 poppy fields was surveyed for the purpose of estimating opium yield. As in 2012, the yield survey was limited to low-risk areas where the security situation allowed access and enough time to carry out all measurements. Together with close supervision of field work, this ensured a very high degree of compliance with the yield survey protocol. |8| All yield data obtained in 2014, except for the data relating to one field collected in Badakhshan, met the strict quality criteria introduced in 2011. The Southern region continued to produce the vast majority of opium in Afghanistan in 2014, representing 69% of national production. The Western region was the country's second most important opium-producing region (16%). The rest of the country contributed 15% of total opium production. 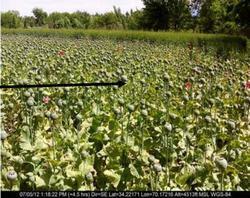 Provinces are defined as poppy-free when they are estimated to contain less than 100 hectares of opium cultivation. * In 2014, Gizab district of Day Kundi province has been considered under Uruzgan province. The 2014 poppy cultivation estimates of Day Kundi and Uruzgan are therefore not comparable with previous years. 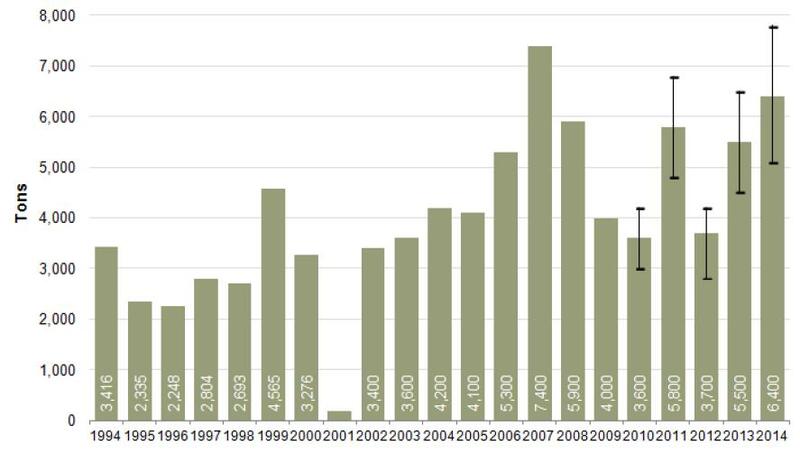 Sources: UNODC and UNODC/MCN opium surveys, 1994-2014. The high-low lines represent the upper and lower bounds of the confidence interval of the estimates. Figures refer to oven-dry opium. 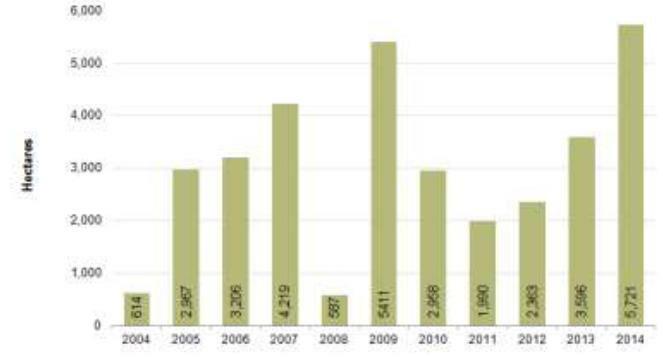 Production figures for 2006 to 2009 have been revised; see UNODC/MCN Afghanistan opium survey 2012. All the opium produced in Afghanistan each year is either exported as raw opium or heroin/morphine, consumed domestically in various forms, seized, stored for later use or lost (for example, due to mould, disposal to avoid seizures, etc.). the shares of opium in the form of raw opium or heroin that are seized or lost, and the remainder (if any), which does not enter the market in the year of interest. There is a clear understanding of the approximate amount of opium produced. However, the shares converted to morphine and heroin and the purities of these substances are much less clear as only secondary data can be used as a proxy. In the case of seizures, for example, the purity of the heroin seized is often not known. Likewise, the purity of heroin consumed domestically may differ substantially from the purity of heroin destined for export. Furthermore, little is known about when and where the conversion of morphine to heroin takes place. One component, the amount of raw opium needed to produce a kilogram of heroin/morphine, has been under investigation by UNODC/MCN, and recent results on the morphine content of Afghan opium led to an update of the quantity of opium needed to do so. In the following sections, all the factors related to the conversion ratio of opium to pure heroin base are discussed. The concept of heroin of export quality (impure heroin), which is the more adequate measure for describing the opiate economy of Afghanistan, is then introduced. Based on these results, the potential heroin production yielded from the 2014 opium production is subsequently estimated. Prior to this update, UNODC used a conversion ratio of opium to heroin of unknown purity for estimating the amount of heroin produced from a year's harvest of opium. The ratio described the amount of opium needed for producing a kilogram of heroin, without specifying the purity of the heroin yielded. With this update, UNODC no longer uses the concept "heroin of unknown purity", but instead introduces two different concepts for estimating heroin production: "conversion to pure heroin base" and "conversion to heroin of export quality" (impure heroin). 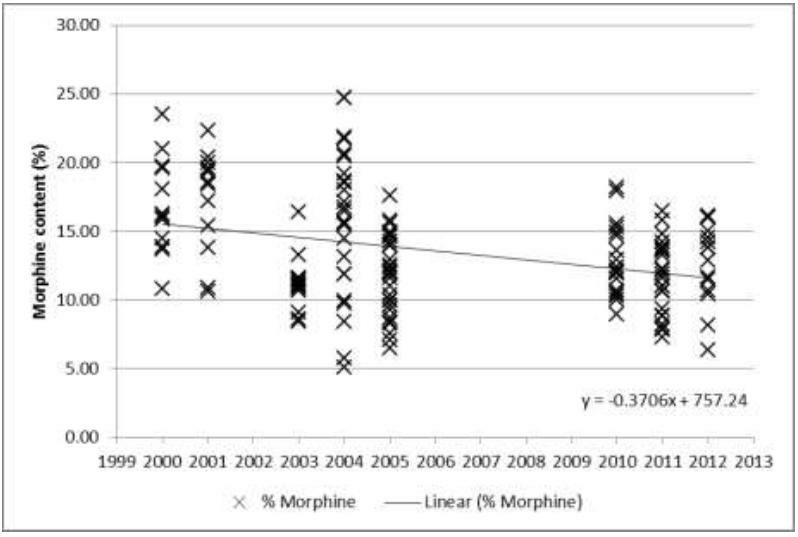 Figure 14 shows the morphine content of all opium samples collected between 2000 and 2012 with a linear trend line. Between 2000 and 2003, 39 opium samples from different regions of Afghanistan, which contained an average of 15.0% morphine content (95% confidence interval �1.32), |12| were analysed. In 2004 and 2005, a total of 56 opium samples was collected and analysed, which had an average morphine content of 13.6% (95% confidence interval �1.2). |13| From 2010 to 2012, 57 opium samples from all regions of Afghanistan were collected and analysed, which presented a statistically significant |14| lower average morphine content of 12.3% (95% confidence interval �0.7) |15| than the average from 2000 to 2005. A trend analysis of all yearly data reveals a statistically significant |16| declining trend of average morphine content. Based on recent trends, the simple |17| average of the morphine content of all samples collected between 2010 and 2012 was used (12.3%) for the calculations in this section. When more data becomes available, the morphine content will be updated. Figure 14: Morphine content (%) of all samples analysed between 2000 and 2012, with linear trend line. Note: the error bars reflect the 95% confidence intervals of the annual means. the efficiency of the heroin laboratory in extracting morphine from opium and in converting the yielded morphine to pure heroin base (laboratory efficiency). 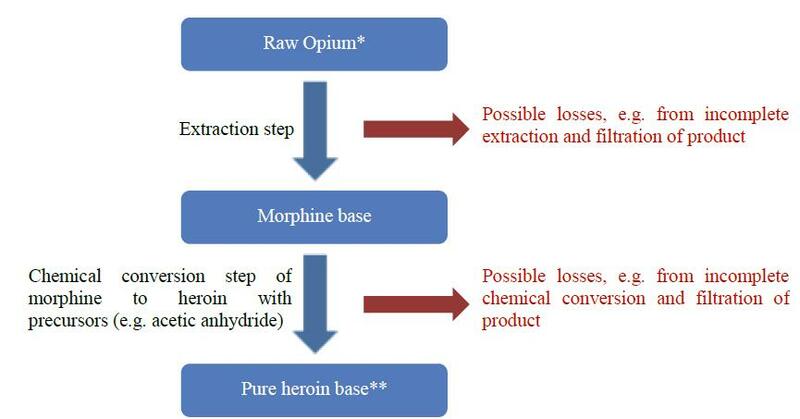 Raw opium is converted into heroin base in two main steps (see Figure 16 for a simplified flow chart). In the first step (the extraction step), morphine (and other alkaloids) are extracted from raw opium by adding hot water and chemicals such as calcium oxide and ammonium chloride. Theoretically, 100 kilograms of opium with an average morphine content of 12.3% |19| can yield 12.3 kilograms of pure morphine (12.3% of 100). However, in reality, traffickers are not well trained chemists and do not work under optimal conditions, thus it is unlikely that the full potential of raw opium is used, and a certain percentage of potential morphine production is lost at this stage. Figure 16: Simplified flow chart illustrating the main stages of processing pure heroin base from opium. Note: *oven-dried values are used in estimation; **For the purpose of comparability, 100% pure heroin base is considered. In the second step, morphine base is converted to heroin base by adding precursor substances such as acetic anhydride. During this step, when it becomes pure heroin base, the morphine molecule gains two additional "acetyl groups" from the acetic anhydride. These additional molecules add weight to the morphine base: in an optimal scenario, when morphine is completely converted into pure heroin base, the heroin output is 1.29 |20| times heavier than the morphine used as input. Thus, 1 kilogram of pure morphine can theoretically yield 1.29 kilograms of pure heroin, if the reaction goes to completion. But this reflects only a potential weight gain as losses also occur at this stage. The combined losses in both steps are reflected in "laboratory efficiency", which is a measure of the ability of traffickers and clandestine chemists to extract morphine from opium and to convert it into heroin. Laboratory efficiency is expressed as the percentage of actual amount of pure heroin base produced over the theoretically possible, maximum output (potential amount). Laboratory efficiency can vary substantially, depending on factors such as the skills and efforts of the chemists producing the heroin, the availability and quality of precursor substances, and the equipment used. average morphine content (%) x chemical conversion ratio (1.29) x laboratory efficiency (%). While there is updated information on morphine content available, little is known about the laboratory efficiency of heroin laboratories in Afghanistan. When the opium/heroin conversion ratio was revised in 2005, the underlying assumption was a laboratory efficiency of 60-70% together with a heroin purity range of 45-85%. These percentages were based on interviews with key informants and seizure data (purity). In the same year, a study |21| conducted by the Federal Criminal Police Office, Wiesbaden, Germany was published, in which white heroin hydrochloride was produced by using locally seized substances and equipment. In this experiment, a laboratory efficiency |22| of 34% was achieved in the conversion of raw opium of low quality (8.5% morphine content) to pure heroin base. This is the only study available to date that has investigated laboratory efficiency in Afghanistan |23| under local conditions. The main uncertainty surrounding the conversion ratio of opium to pure heroin base is thus due to a lack of information on the average efficiency of heroin laboratories in Afghanistan: the processing of illicit heroin from opium is normally carried out with readily available equipment such as buckets, barrels, pots and cloth. |24| Precursors and chemicals used, such as acetic anhydride, ammonium chloride, acids, bases and solvents, are of unknown purities. Furthermore, laboratory operators may be experienced but seldom have any background in chemistry. All these factors considered, laboratory efficiency can vary anywhere from 30% to 70% efficiency and an assumption of either percentage could be either a gross under- or over-estimation. When estimating the quantity of pure heroin base yielded from annual Afghan opium production, UNODC/MCN uses a laboratory efficiency of 34% for the estimation of the conversion ratio of opium to pure heroin base. Note: 12.3% is the average morphine content of all samples collected between 2010 and 2013; 15% is the average morphine content of all samples collected between 2000 and 2003 and was the basis for the 7:1 ratio introduced in 2005. As only a few studies on Afghan heroin processing have been undertaken so far, and only one considered laboratory efficiency, more research on heroin processing procedures and laboratory efficiencies in Afghanistan is needed for estimating a more accurate opium/heroin conversion ratio. Moreover, the collection of data on morphine content should be continued and the heroin conversion ratio should be updated at least once every five to ten years, so that the annual Afghanistan heroin production estimate is based on the most current available data. The amount of pure heroin produced can only be a theoretical measure of the heroin output of Afghanistan opium production: heroin is rarely traded in its pure form and comes as brown heroin base or white heroin (heroin hydrochloride). It is also cut with diluents such as caffeine, chloroquine, phenolphthalein and paracetamol. |26| When aiming to reflect local markets and estimate heroin availability for consumption, an estimate of the amount of heroin of export quality (quality of heroin traded by traffickers at the wholesale level) produced in a given year is a more informative measure. Pure heroin can only give a crude indication of market size. Scarce data is available for the purity of heroin exported from Afghanistan. In 2012, Tajikistan reported purities of heroin at the wholesale level of 0.3% to 65%. |27| In 2013, the range was even larger (0.4% to 79%), but a typical range of 20% to 35% was also reported. |28| Kazakhstan (Republic of), reported ranges of 1.0% to 39.9% and 0.1% to 36.5% in 2011 and 2012, |29| respectively. In 2013, Kazakhstan reported a typical range of 20% to 25%. |30| No official data on the purity of heroin seizures in Afghanistan are available. Numbers in parenthesis are minimum and maximum values. Heroin of high purity is smaller in volume than heroin of low purity, so it is easier to transport. Drug traffickers therefore have an incentive to traffic heroin of high purity and to cut it only when it gets close to its destination country. When estimating the amount of heroin of export quality produced, an average purity of 52% for wholesale is thus assumed (purity reported by Turkey in 2012). Based on the conversion ratios of opium to pure heroin base, the amount of opium with a 12.3% morphine content needed to produce 1 kilogram of 52% pure heroin is 9.6 kilograms (9.1 to 10.2 kilograms), yielding a 9.6:1 ratio for converting opium to heroin of export quality. Apart from morphine content, none of the factors in the opium-to-heroin estimation chain are well researched. The use of an average laboratory efficiency of 34% for the estimation of the conversion ratio of opium to pure heroin base is based on very little evidence, as only one study is available. Even less is known about the average purity of heroin produced in Afghanistan. The following has therefore to be considered as a rough estimate and more as an indication of the order of magnitude than as a precise measurement. The following table shows potential production of pure heroin and of heroin of export quality if 62% of potential opium production is converted to heroin and if all opium is converted to heroin. A ratio of 18.5:1 (17.5:1 - 19.6:1) is used for converting opium to pure heroin base. For converting opium to 52% pure heroin, 9.6 kilograms (9.1 to 10.2 kilograms) of opium are assumed to be needed. 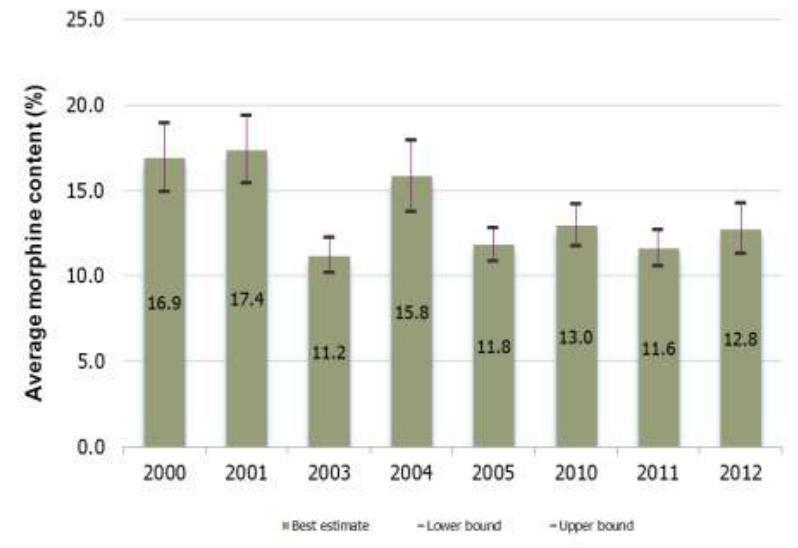 Opium prices remained high in 2014 but decreased in all regions of Afghanistan, making 2014 the third year to show a decreasing trend since the price hike caused by the 2010 poppy disease. MCN/UNODC has monitored opium prices in selected provinces of Afghanistan on a monthly basis since 1994 (18 provinces as of September 2011). In 2008/2009, opium prices were at a low level but increased after that, most noticeably in the Eastern, Southern and Western regions, before reaching a maximum in 2011 after the unusually poor harvest caused by a disease of the opium poppy. In 2011, opium prices started to decrease around harvest time in some regions, but remained volatile and at a higher level than in any year since 2005 (in absolute terms, not adjusted for inflation). This decrease can be explained by the relatively good 2011 harvest, since when reported opium prices have shown a decreasing trend in all regions, with an overall decrease of 23% between 2013 July and 2014 July. Dry opium prices reported by traders showed the same decreasing trend in all regions, with an overall decrease of 29% in the same period. Source: MCN/UNODCMonthly Price Monitoring System. Source: MCN/UNODC Monthly Price Monitoring System. Amounting to US$ 853 million (US$ 680-1,030 million), the farm-gate value of opium production in 2014 decreased by 13% from its 2013 level. 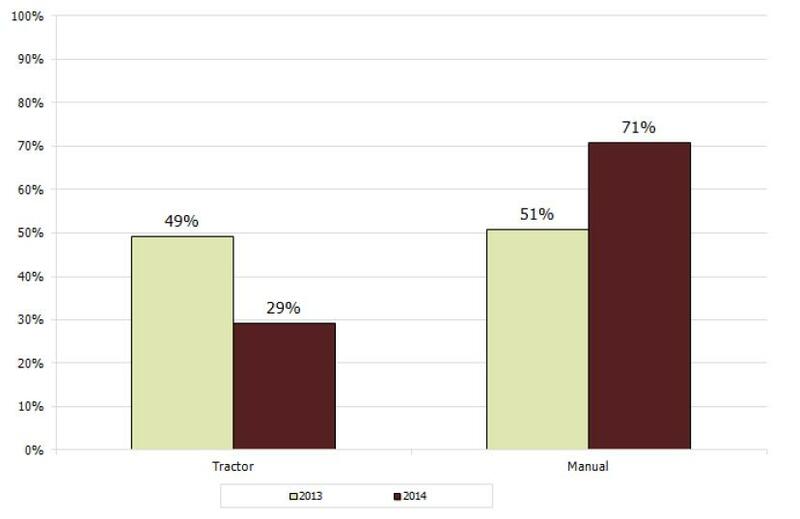 The decrease in farm-gate value was mainly due to the 23% price decrease. Farmers in Hilmand, the country's largest opium-producing province, earned some US$ 394 million, which was equivalent to 46% of the total farm-gate value of opium production in Afghanistan in 2014; a decrease of 13% from 2013 (US$ 945 million). Figures for 2008 and 2009 were recalculated from the revised opium production estimates, see MCN/UNODC Afghanistan Opium Survey 2012. Ranges were calculated proportionally to the previously published estimate. This chapter covers various methodological aspects regarding survey design and estimation procedure. Remote sensing methodologies have been used by UNODC since 2002 to monitor the extent of opium cultivation in Afghanistan. Changes in the location of opium poppy cultivation and the increased security difficulties involved in accessing the area under scrutiny require continuous improvements of the sampling designs applied. 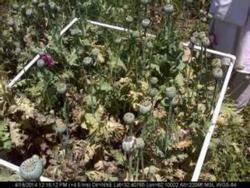 A sampling approach is used to cover those provinces where most of the poppy is found, whereas a targeted approach is used in provinces with a low level of opium cultivation. "Targeted approach" means that a certain area of a province is fully covered by satellite imagery. In 2014, out of 34 provinces in Afghanistan, 11 were sampled and 11 were targeted. The remaining 12 provinces were considered to be poppy-free |33| based on information from the field. These provinces were not covered by the remote sensing survey, but were covered by the village survey. The area available for agriculture was updated based on Landsat 8 ETM images and DMC images. 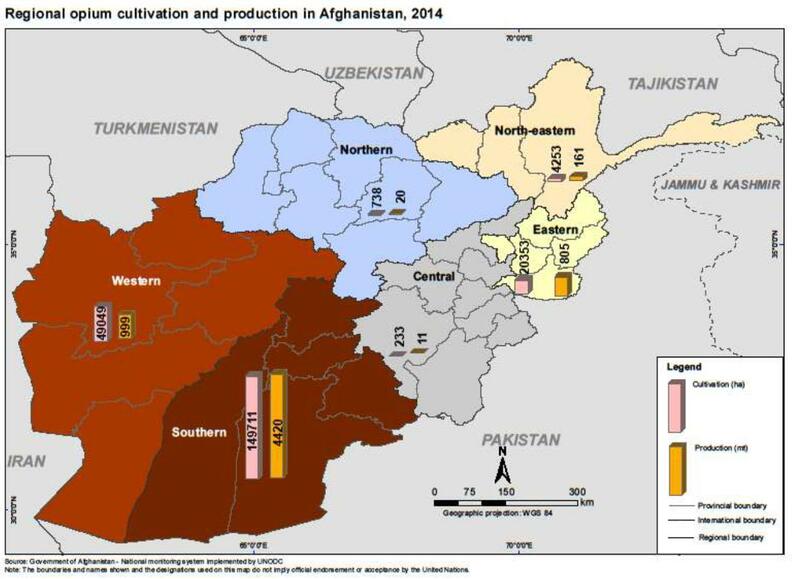 The total estimated agricultural area in Afghanistan in 2014 amounted to 78,753.04 km2. The sampling frame was established by extracting the area of land potentially available for opium cultivation in 11 provinces. This area was divided into regular 10 km by 10 km grids, which constituted the sampling frame. The final sampling frame, from which the satellite images were randomly selected, consisted of 1,463 cells in 11 provinces. In the case of images that cut across provincial boundaries, only the part falling into a particular province was considered to be in that province. The area available for agriculture in the sampling frame covers irrigated and rain-fed land. The total area in the 11 provinces was 23,563 km2, which is equivalent to 30% of all potential agricultural land in Afghanistan. Potential land refers to all land available for cultivation and also includes land that is currently fallow. Cells containing less than 1 km2 of potential agricultural land were excluded from the sampling frame in order to reduce the likelihood of choosing cells with very little arable land. In total, the exclusions represented less than 2% of the total potential agricultural land. In 2014, high-resolution satellite images were acquired for 163 sampled locations 10 km by 10 km in size, covering a total of 11 provinces and 65 locations, for the 11 target provinces in Afghanistan. * The sampling locations were changed or newly introduced in these provinces. The sample size (meaning the number of images acquired in each province) was approximately proportional to the square root of the area of potential agricultural land. This allocation methodology is one form of compromise between the appropriate allocations for producing national estimates and for producing provincial estimates. A minimum number of eight sample cells was set. The total number of images was constrained by cost considerations and the maximum number of images that the satellite provider could handle given the limited time window for each image. The same image locations as in 2013 were used in 2014 for 7 out of the 11 sampled provinces. To account for the dynamics of poppy cultivation and the re-allocation of Gizab district from Day Kundi to Uruzgan, the provinces of Day Kundi, Kandahar, Uruzgan and Zabul were re-sampled. In the provinces of Day Kundi, Farah, Hilmand, Kandahar, Nimroz, Uruzgan and Zabul, the study area ("frame") was divided into compact geographical strata of approximately equal area by applying a clustering algorithm ("k-means") in the statistical software R. In each stratum, two sampling locations were selected by simple random sampling. This method ensured a good geographical coverage by sampling locations while allowing for an unbiased estimation of the variance. In Hilmand and Nimroz, the area was additionally separated in two substrata: in Hilmand, this accounted for the lower poppy cultivation density in the former "Food Zone"; in Nimroz, it accounted for the high concentration of poppy cultivation in Dilaram district. This allowed the provision of two separate poppy estimates in Hilmand: one for the total area under cultivation in the province; and one for the area under cultivation within the former (2012) Food Zone. Gizab district was targeted. In Badakhshan Nangarhar and Kunar provinces, a one-stage systematic random sampling approach was employed in which a sampling rule was applied that ensured good geographic coverage. Starting from a randomly chosen cell, every kth element from then onwards was chosen, where k is determined by the number of cells in the frame and the desired sample size (the actual sample size might differ slightly). To avoid adjacent cells, every other line was skipped. In Nangarhar province, the districts Dara-e-Nur, Kuzkunar, Kama, Behsud, Jalalabad and partially Surkhrod were excluded from the frame. In the remaining provinces, a historically grown, non-random sample was used. It is also planned to apply a new sampling strategy in these provinces in 2015. The estimation of the extent of opium poppy cultivation is a ratio estimate for each of the provinces, using potential agricultural land as an auxiliary variable. The national estimate was obtained by adding up the provincial estimates in what is known as a separate ratio estimate. 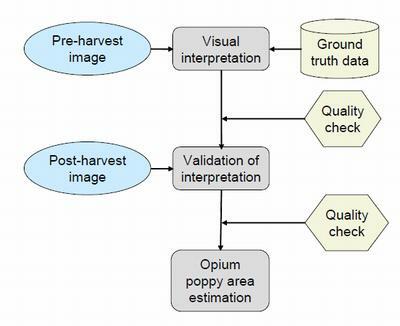 The Hansen-Hurwitz estimator is one method of estimating the extent of opium poppy cultivation when the probability of selecting sampling units is not equal. where nk is the number of satellite image locations within the province. Pi is the area of poppy cultivation in image i.
Ri is the area of land potentially available for poppy cultivation (risk area) in image i.
Rs is the total potential land available for poppy cultivation (risk area) from the sampling frame in province k.
with the same notation, as above. In all remaining provinces where no unbiased estimator for the variance was available, confidence intervals were calculated using the bootstrap method with 100,000 iterations. Bootstrapping consists of re-sampling with replacements from the original sample. After each iteration, the area under cultivation is estimated. After 100,000 iterations a distribution of cultivation areas can be observed and the 95% confidence interval is derived by using the 2.5 and 97.5 percentiles. In Badakhshan the lower confidence interval was calculated by summing up the poppy in the sample and subtract eradicated area. To express the uncertainty associated with the national area estimation, which includes the provinces covered by the targeted approach and the sample provinces, but excludes provinces with an estimate of less than 100 hectares (which are considered "poppy-free" and not counted), a range was calculated by adding the poppy area figures of the target provinces to the upper and lower limits of the 95% confidence interval at the national level. The consensus view of those working in Afghanistan was that the MCN/UNODC surveillance system developed in the provinces can identify sites where poppy was grown, with further inputs being obtained from the survey of village headmen. 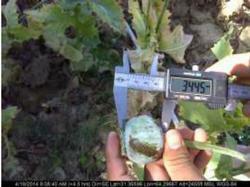 Fieldworkers visited potential poppy-growing sites to confirm the situation and provided GPS references for the sites. If geographical clusters of sites were identified, targeted satellite images were obtained to measure the areas involved. The total poppy area of a target province is equal to the poppy area measured on the imagery without any further calculation. For a list of provinces for which the target approach was used see Table 4. In provinces where satellite images were targeted, the estimated area under opium cultivation is not affected by sampling errors, although they may be affected by the omission of areas with very little cultivation. Area estimates of target provinces should therefore be considered as a minimum estimate. District level results are indicative only. A combination of different methods is used. If districts are covered by sampled cells, the average value of these cells is used. In the case of districts where sampled cells were not available, two methods were used to calculate district estimates. If the agricultural area of a district with a sample grid extended into a neighbouring district(s) without interruption, the poppy proportion of the sample grid was also used for the neighbouring district(s). For districts with isolated, non-contiguous agricultural areas, the average poppy proportion of the province was applied. The methodology and sample was not designed to produce results at the district level. Due to the difficult security situation in many parts of Afghanistan, which prevented surveyors from carrying GPS and mapping equipment, an insufficient number of ground segments could be visited in order to conduct a systematic accuracy assessment. The area figure presented is the net harvestable opium poppy cultivation area. The effect of poppy eradication activities was taken into account based on data from the eradication verification survey, which provides exact GPS coordinates of all eradicated fields supplemented with additional information. The gross cultivation areas would be the net cultivation plus eradication. In provinces where the poppy area is estimated with a sampling approach, the first step is to calculate the gross poppy cultivation area. The total area eradicated in those provinces is then deducted from the mid-point estimate of the provincial cultivation estimate to obtain the net cultivation area. If eradication activities were carried out after the date of the image acquisition, no adjustment is necessary as the poppy present in the image reflects the gross poppy area. If eradication activities were carried out in a sample block before the date of the image acquisition, the area interpreted as poppy would not reflect the gross area. Therefore, the eradicated fields are added to the interpreted fields. The adjusted poppy area figure for the block is then used for the provincial estimate. In provinces where the poppy areas is estimated with a targeted approach (census), eradication activities that happened before the date of the image acquisition are already reflected, as these fields no longer appear as poppy in the image. Fields that were eradicated after the date of the images acquisition are simply deleted. The acquisition of satellite images at the appropriate growth stage of the opium poppy is key to the successful identification of opium poppy fields on satellite images. 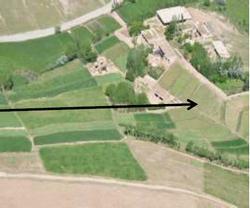 Satellite data is collected at two stages: the pre-harvest (flowering) stage and the post-harvest (post-lancing) stage. In recent years, detailed information on the crop growth cycle of each district has been collected in the form of a phenological chart, which is useful for deciding on appropriate dates for satellite data acquisition. First-dated images of the Southern, Eastern and Western regions are collected during March and April due to the early cultivation and maturity of crops in those regions. The crop growth cycle begins later as one goes northward. Images of the North and North-eastern region are acquired during May, June and July. Second-dated satellite images are collected approximately two months after the first images are collected. The normal time window for satellite data acquisition is one month, depending on the scheduled passing of satellite and weather conditions. The time window for first-dated image acquisition begins at the full flowering stage and continues through the capsule stage. Second-dated image acquisition begins towards the end of the lancing stage and continues until the opium poppy fields are ploughed. Images acquired in the middle of the prescribed time window facilitate optimum discrimination between opium poppy and other crops. The figure below illustrates the spectral characteristics (Normalized Difference Vegetation Index; NDVI) of opium poppy and other crops between February and June. Wheat and opium poppy have the same growth cycle between March and June, as illustrated. The spectral differences between those two crops are more pronounced in February, which marks the beginning of the capsule stage of the crop in this example. Poppy fields are ploughed immediately after the harvest, whereas wheat fields are not. 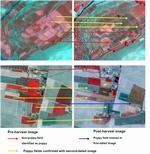 That is why two-dated images (pre-harvest and post-harvest) are collected for the same location. The figure above illustrates the growth cycles of opium poppy, wheat and clover from February to June, with the help of ground photographs. 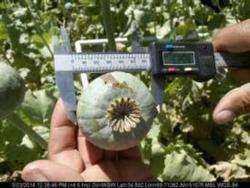 Note that maximum visual discrimination between opium poppy and other crops is possible during the flowering/capsule stage and after capsule lancing. 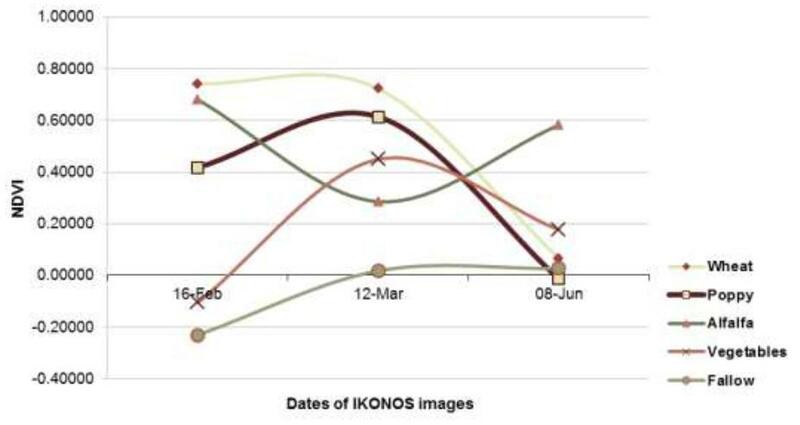 The different phenological stages described above are shown in the figure on the previous page (field photographs of opium poppy, wheat and clover on different dates). First-dated images were acquired during the flowering or capsule stage and second-dated images were acquired after the opium harvest. For example, wheat appears mostly in bright red on the first date image in false colour composite (full coverage with vegetation appears in red; bare soil in grey/green), while opium poppy fields are shown in tones of pink. Although there can be some confusion between opium poppy and wheat in the first-dated images, the acquisition of second-dated images makes it possible to distinguish opium poppy from other crops, because the opium poppy crop has been harvested and the fields appear in grey/green. Visual interpretation was used to delineate opium poppy fields by interpreting IKONOS images covering a 10 km by 10 km area. Ortho-rectified IKONOS, QUICKBIRD, WORLD-VIEW2 and GEO-EYE images of 1 m resolution and 0.5 m resolution (PAN-sharpened) were used for this purpose. Opium poppy was initially identified using first-dated high resolution images. Ground truth information collected in the form of segment maps and GPS points was also useful in identifying opium poppy fields. The interpretation based on first-dated images was improved using patterns of observation in second-dated images. Aerial photographs of the poppy fields were acquired using helicopters in the provinces of Kandahar and Hilmand during the eradication season, as well as in Kabul, Kapisa, Kunar, Laghman and Nangarhar provinces during the flowering and capsule stages. These photographs were tagged by latitude and longitude and facilitated to locate the poppy areas on satellite images, and were very helpful in confirming the poppy areas in the satellite images. 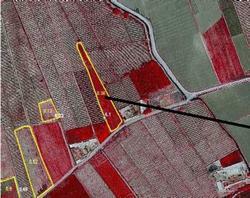 Poppy field boundaries in 2012 were delineated by an onscreen digitization method. Two kinds of band combination were used to detect opium poppy. True-colour combination (blue, green, red) was used in areas where land use is dominated by opium (for example, Hilmand and Kandahar) and in cases where images were obtained during the flowering and lancing stages of opium poppy. False-colour combination (infra-red, red, green) was used in almost all cases. Analysts used both combinations simultaneously to optimize discrimination between opium poppy and other crops. Some of the images could not be acquired at the appropriate time due to weather conditions and/or the time at which the satellite passed. 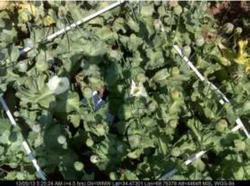 The delayed acquisition of images makes it difficult to detect opium poppy, since fields may be at the senescence stage due to the lancing of capsules and can therefore be confused with fallow fields. In such cases, second-dated images are often useful in confirming opium poppy fields, since harvest patterns are different for wheat and opium poppy. Ground reference data were collected in the form of GPS points, field photographs and aerial photographs. Some 1,854 GPS points of poppy fields, supported with pictures, were collected from the provinces of Takhar, Sari Pul, Baghlan, Balkh, Faryab, Kapisa. GPS point data were superimposed over the ortho-rectified satellite images to facilitate identification of poppy fields during visual interpretation. Natural colour aerial photographs acquired from helicopters were co-related with the satellite images to identify poppy from other crops, as shown below. Visual interpretation of single-dated very high-resolution images was a relatively easy task in Hilmand, Kandahar, Uruzgan, Farah and Nimroz provinces. This was due to larger field sizes and timely acquisition of the images. Interpretation in target provinces Nangarhar, Laghman, Kunar, Kabul, Kapisa, Hirat, Ghor, Baghlan, Faryab and Badakhshan was easy with the help of GPS points and aerial photographs. Interpretation of images in Badghis and Zabul was more difficult since the spectral signatures of opium poppy were not as clear as in Hilmand, Kandahar, Uruzgan and Nangarhar. The second-dated images were useful to distinguish poppy from barley, wheat and grapes in certain provinces, namely Kabul, Kandahar and Nangarhar, particularly where the first-dated images were acquired late during the senescence stage. The second-dated (post-harvest) images were therefore useful in confirming whether the opium poppy on the first-dated images had been correctly identified. Image acquisition at two different times (pre- and post-harvest) is thus proven to be essential in such cases. A quality control mechanism was applied to the image interpretation process, with each analyst's work being checked by two other experts. Both first-dated and second-dated images were crosschecked. All fields determined as likely to be under opium cultivation (potential opium poppy fields) were delineated on the basis of the interpretation of first-dated satellite imagery. In some cases a second-dated image was acquired for the purpose of confirmation. The corrections involved a few commissions and omissions. The relationship between poppy capsule volume per square metre and dry opium yield is used to estimate opium production. |35| It takes the form of a non-rectangular hyperbola. VC = Mature capsule volume (cm3/m2). In the yield survey, data on the number of yield capsules per plot and capsule volume are collected. The survey follows the procedure established in the UNODC Guidelines for Yield Assessment. An imaginary transect was drawn on each surveyed field, along which three one-metre square plots were selected. 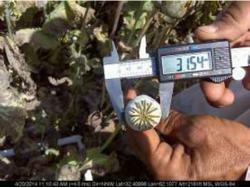 In each plot, the number of flower buds, flowers, immature capsules and mature capsules that were expected to yield opium were counted, and the diameter and height of 10 to 15 opium-yielding capsules were measured with a calliper. The capsule volume per square metre was calculated with these data and entered into the formula for the yield calculation. Each plot thus provided one yield observation. The simple average of the three plots in a field is the field yield. The simple average of all fields in a region is the regional yield. A range was calculated to express the uncertainty of the yield estimate due to sampling with the 95% confidence interval. Since 2012, the yield survey has been significantly reduced in comparison to previous years. Due to the increasingly difficult security situation, only fields where it was possible to complete the survey without time pressure were visited. Furthermore, training was improved and surveyors worked in pairs rather than alone. The survey is therefore no longer statistically representative. To further enhance data quality, data quality checks developed with external experts were applied. The statistical tests developed in 2011 |36| were applied to the capsule measurements, i.e. to the values reported regarding height and diameter, and thus the resulting capsule volumes. Regarding the number of capsules contributing to yield per plot, no systematic tests are available. The results showed that data continued to be of a high quality. 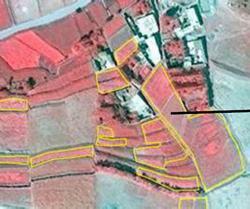 In 2014, only data collected in one single village in Badakhsan (3 fields) had to be excluded. MCN and UNODC continue to work on improving the yield surveys. Opium production was calculated by the estimated regional area under opium cultivation being multiplied by the corresponding regional opium yield. All opium estimates in this report are expressed in oven-dry opium equivalent, i.e. the opium is assumed to contain 0% moisture. The same figure expressed in air-dry opium, i.e. opium under "normal" conditions as traded, would be higher as such air-dry opium contains some moisture. The point estimates and uncertainties of the opium production estimate due to sampling of the area under poppy cultivation and yield can be expressed as ap � Δa and yp � Δy, respectively, where the uncertainty is determined from the 95% confidence intervals. expresses the error in production, Δp, resulting from uncertainty in the estimates for cultivation area and yield. The proportion of opium converted into morphine and heroin was derived from seizure data in Afghanistan and its neighbouring countries. A three-year average of all reported amounts was taken. In order to estimate the share of opium converted to heroin, all heroin and morphine seizures are converted into opium equivalents by applying the opium to heroin conversion ratio for heroin of export quality. As seizures are often driven by pure chance and seizure data have some inherent uncertainties, changes should be interpreted with caution. Information from the CNPA laboratory indicates that not all assumed seizures of heroin turn out to actually contain heroin, or they contain heroin in combination with various other substances. |37| This is rather typical for seizures and not specific only to Afghanistan. UNODC/MCN has improved field-based verification activities since 2010 by enhancing the control mechanism. The areas verified by eradication verifiers were randomly checked by the team leader and UNODC/MCN survey coordinators for validation of the reported figures. A total of 124 eradication verifiers were trained in eradication verification techniques and deployed in a phased manner to provinces where eradication activities were envisaged. The eradication verifiers were part of the eradication teams led by the respective provincial governor. Verifiers reported to the office of Provincial Governors in the last week of February 2013. Eradication verifiers were part of the Governor-led eradication teams. The verifiers took measurements of each eradicated field by their pace length, converted them into metres and calculated the area in jerib (1 jerib=2000 m2), collected field coordinates using new GPS cameras and took photographs. The verifiers drew sketch maps of each field as a reference for area calculations. The verification-reporting officers in Kabul obtained the provisional data from the verifiers by telephone (mobile/satellite phones) and updated the database on a daily basis. The verifiers filled in hardcopy survey forms and submitted them to UNODC regional offices. The forms were then sent to the Kabul office for data entry. Quality control was undertaken by MCN/UNODC survey coordinators at the regional level. Eradicated fields were revisited randomly by team leaders and MCN/UNODC survey coordinators to check the accuracy of the reports. Further validation of the results was done using data obtained through helicopter flights, as well as from satellite imagery, to calculate the final area of eradicated poppy fields wherever possible. In Hilmand province, the area calculations of the eradicated poppy fields was facilitated by calculating the area of fields automatically using a standard template in Excel file, thus avoiding manual calculation errors at the field level. MCN/UNODC published periodical reports on a weekly basis to inform stakeholders of eradication activities. The eradication figures provided in these reports were considered provisional until they were finalized based on field checks and/or checks based on the satellite image interpretation. Since 2009, farm-gate prices at harvest time have been derived from the opium price monitoring system and refer to the month when opium harvesting actually took place in the different regions of the country, which is thought to reflect opium prices at harvest time better. To calculate the national average price, regional price averages were weighted by regional opium production. The opium price in the Central region was calculated from the annual village survey, as there is no monthly opium price monitoring in that region. The farm-gate value of opium production is the product of potential opium production at the national level multiplied by the weighted average farm-gate price of dry opium at harvest time. The upper and lower limits of the range of the farm-gate value were determined by using the upper and lower opium production estimate. p-f: poppy-free according to the definition of the respective year. This concept was introduced in 2007. In 2007, provinces with no poppy were considered poppy-free; since 2008, provinces with less than 100 hectares of poppy have been considered poppy-free. This document has been published on 19Jan16 by the Equipo Nizkor and Derechos Human Rights. In accordance with Title 17 U.S.C. Section 107, this material is distributed without profit to those who have expressed a prior interest in receiving the included information for research and educational purposes.